How one Frenchwoman’s stint in New York City helped her find her roots. Dugas’ family has been in the wine business since her great-grandmother cultivated their first vines in Champagne back in the 1930s. “As a girl I watched my mother open a bottle of her family’s champagne at nearly any excuse,” she writes. “A friend stopping by the house? Champagne! The sun coming out after a little rain? Alors! Champagne! But the truth is that I knew almost nothing about it, except that there was plenty in the pantry.” Despite her lack of knowledge, Dugas jumped at the chance to work for her uncle as a wine representative in the United States. She could live in New York City, learn English, and be able to travel America, all while learning about wine. In this delightful memoir, the author recounts her first two years in New York, first working for her uncle, then as a champagne rep for Pringent, and finally as an assistant to a small importer of quality French wines. In the beginning, Dugas struggled to interact with her roommates and business associates while discussing wines in a language that didn’t flow as readily across her tongue as the vintages she poured for her potential clients. But she soaked it all up, the good and the bad, and discovered sheer pleasure in learning as much as possible about each of the wines she represented. She also branched out to experience new wines with a small circle of friends and her boyfriend, who moved from France to New York to be with her. 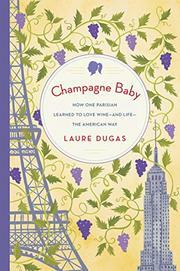 Dugas shows the U.S. from a foreigner’s perspective, which brings an interesting slant to her story. She also includes informative sections on all types of wine in each chapter, providing a minicourse in oenology. A Frenchwoman entertainingly reflects on what she learned about herself, her family’s wine business, and wines in general while living in the U.S.